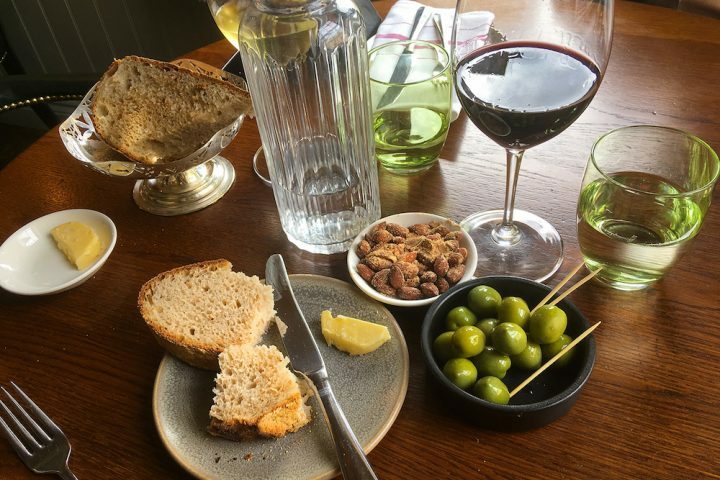 A former tearoom enjoys the golden (crisp, lightly battered) touch of Somerset’s Super Chef Josh Eggleton to become the Salt & Malt fish cafe, restaurant and tearoom. 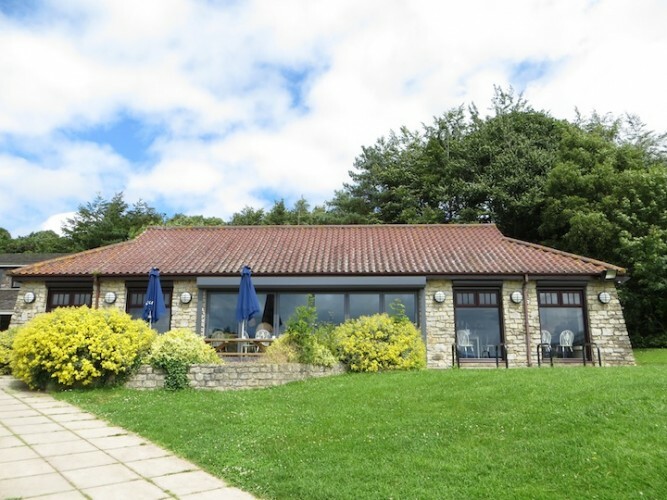 It’s in a fab location overlooking the Chew Valley Lake – actually the largest artificial reservoir in the west country – in north Somerset. 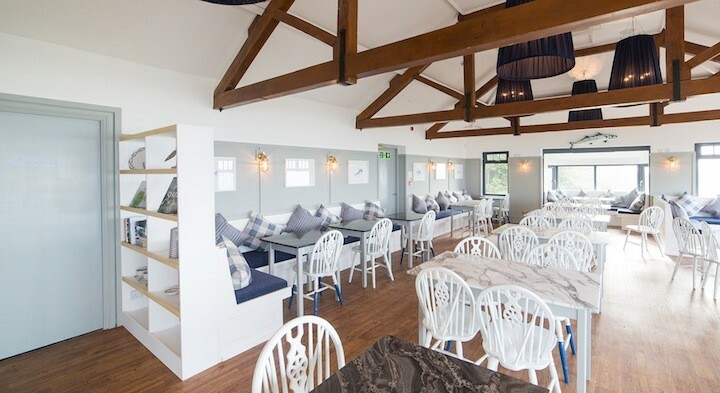 Josh Eggleton (of Michelin-starred Pony & Trap fame) and his team have turned the old tearoom into a light, airy dining room. It’s all plain wood, whites and blues, with fish decorations on the walls and numbered flags on the tables, creating a nautical, Swedish feel. 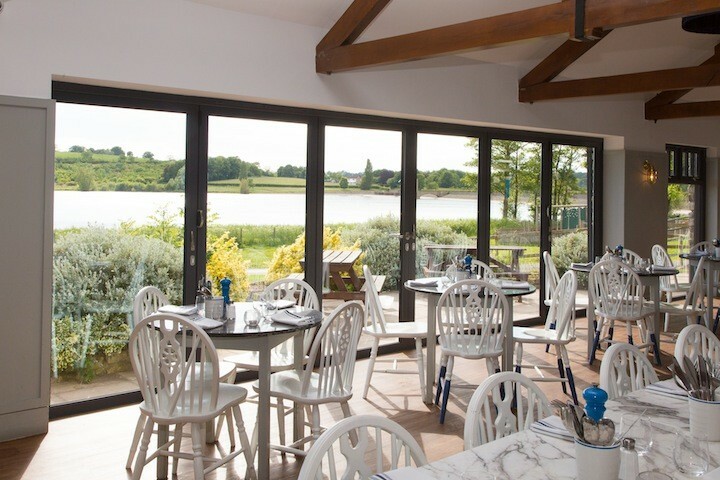 There are great views of the lake from one side of the restaurant and on warm days, the bi-fold windows open up to bring the outside in. You order your food – and pay for it at the end of the meal – at the long, white bar (love the hexagonal tiling) with its impressive super shiny coffee machine and huge vase of sumptuous glads. 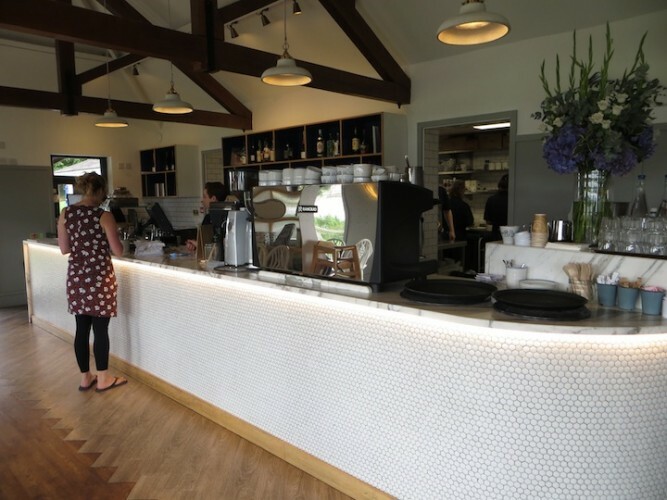 By day, the Salt & Malt serves breakfasts (8.30am-11.30pm), lunches (12pm-3.30pm) and tea and cakes all day (8.30am-5pm). Every evening, bar Sunday, from 5.30pm-9pm, it becomes a proper fish restaurant. 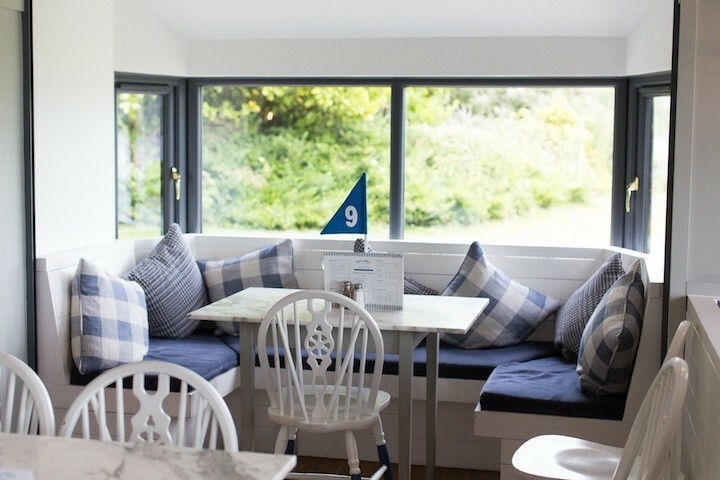 All the food is homemade, the fish and shell fish delivered daily, mostly from the south Cornish coast (although haddock and cod comes from the north Atlantic), and all other ingredients are sourced from the best local suppliers. You’d expect nothing less from the people behind the Pony & Trap gastropub, which has held a Michelin star since 2011. We came for lunch. Obviously fish is on the menu – line caught cod/haddock and chips (all gluten-free), fishcakes, scampi and mussels – but you don’t have to be a pescetarian to eat well here. There’s chicken, ham, bean burger, soup and quiche – as well as sandwiches (prawn, salmon, fish finger, pastrami, cheddar). 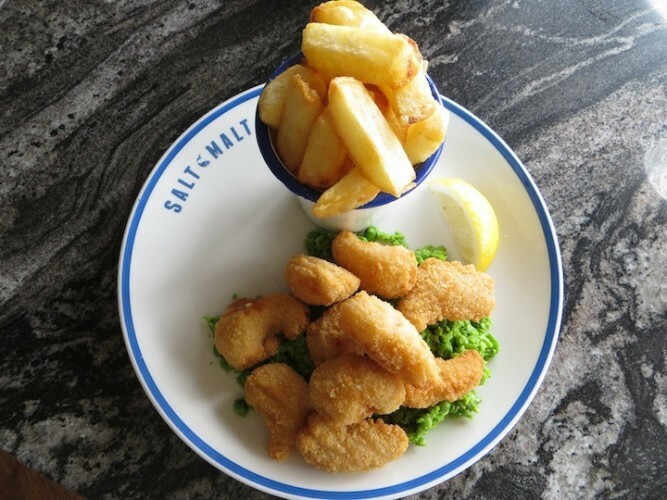 I chose the whole tail Scottish scampi: plump, sweet and succulent within its crunchy, bread-crumbed shell and nestling on a bed of crushed (not mushy) bright green peas, served with chunky chips which were crisp on the outside and fluffy on the inside. 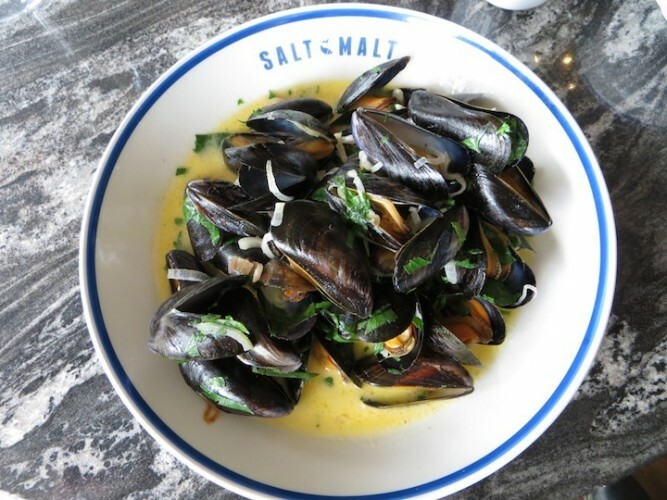 My friend chose a spectacular bowl of steamed mussels, garlic and parsley (and those chips again, which somehow escaped being in the pic), which she said were delicious. A quick peep at the dinner menu revealed starters like chilli squid; citrus cured scallops; beetroot, watercress and ewe’s curd salad. Mains included Massaman fish curry, grilled sole, and saffron aruncini as well as burgers, fish and chips. Sticky pudding and white choc torte were amongst the desserts. I will be back! I can vouch for the takeaway, too (Monday to Saturday 12pm-9m; Sunday 12pm-4.30pm). I came here one hot Sunday when the place was buzzing with all the world and his wife out for the afternoon. 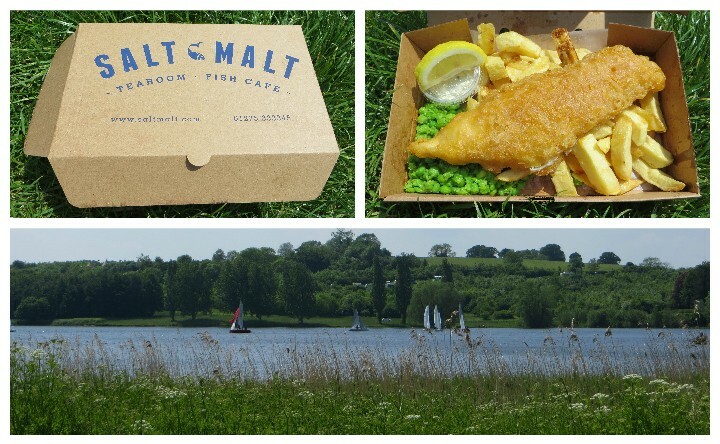 I found a place on the grass and wolfed down my cod and chips, crushed peas and watched the boats sailing on the lake. Bliss. 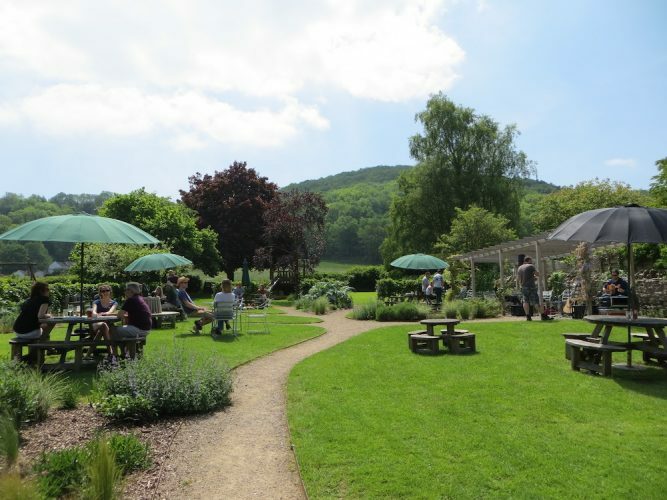 Good for: fish lovers (though there are meat and veggie options too); foodies in the evening; those on a gluten-free diet; families – there’s a kids’ menu and playground with wooden apparatus and swings out front; al fresco (there’s seating outside but it’s near the car park); birdwatchers and nature lovers (the lake is well-known for its migrating wildfowl). Not for: those seeking a quiet lunch, it’s just one big room and it can get quite noisy in the day; those turning up on the hoof at busy lunch or dinner time (I’d say it’s best to book). £££: Reasonable. Breakfast: full English £7.95, veggie breakfast £6.95, smoked haddock with poached egg and bubble and squeak £6.50. Lunch mains £5-£10.95; sandwiches £4.50-5.50. Dinner: starters £2.50-£8; mains £10.50-£16.50; desserts £3-£4.50. Fish and chips around £10. Kids’ meals £3.95.